Sports Costs > How Much Does Little League Cost? How Much Does Little League Cost? Little League is a non-profit organization that organizes local youth baseball and softball leagues in the United States. This league is known to instill many values in a child, including work ethic, team building, and respect for peers, coaches, and umpires. How much does little league baseball cost? On average, little league is going to cost anywhere from $30 to as much as $180+ per player for a basic local parks and recreation league. The costs are going to depend on your geographical location, the age of the child, and the level of competition. Fees for travel baseball, however, can be much more, often as high as $1,000 to $3,000+, plus all of the necessary travel fees. One forum member on this YellowBullet.com forum thread stated that they paid $80 for their child, while another member stated that they had paid $148. Pearland Little League, for instance, charges $140 per player and a small $10 processing fee, according to their official website. On this CafeMom.com forum thread, a few forum members stated that they paid anywhere from nothing to as much as $225 to register their child for a team. FilterJoe.com did a great job breaking down the costs of various leagues for children. According to his breakdown of a recreational league, by the time you factor in the fees, clothes, fundraisers, equipment and miscellaneous fees, you’re looking at $150 to $2,500+. His family, in particular, spent $500 on the baseball season, from the ages of eight to 10. The fees mentioned above will usually include the uniform, including the hat, jersey, belt, and socks. At the end of the season, they may hand out a trophy to the winning team or for those who participated. There may also be medals or certificates. The average little league team will have 10 to 12 players. Little league is open to players who are between the ages of 4 and 18. 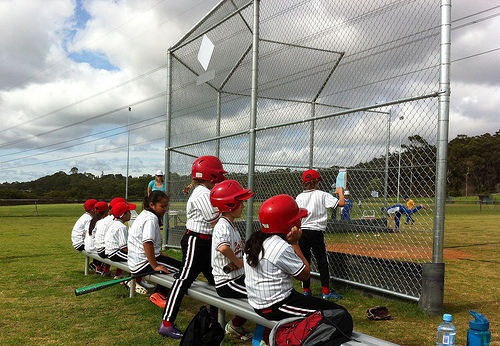 Little league has several divisions, which are based on the gender and age. These divisions include tee-ball, minor leagues, 9-10-year-olds, little league intermediate, junior league, senior league and big league. Tee-ball is designed for both boys and girls who are between the ages of 4 and 5. The minor leagues are for those between the ages of 7-11, while the 9-10-year-old league is for players who are established and want to experience tournament competition. Little League Intermediate is a newer division that was formed in 2013 and was designed to be played on a field with a 50-foot pitching distance and 70-foot base paths. Junior leagues are for boys and girls between the ages of 13-14, while the senior league is for boys and girls between 14 and 16. Lastly, the big league is for both genders who are between 16 and 18. Most little leagues will only include the uniforms, and the player will be responsible for their baseball equipment such as the bats, bag, shoes, batting helmet, balls and glove. You may want extra parts of the uniform as well such as a second pair of socks or cleats. Depending on the type of equipment you purchase, plan on spending at least $150 to get started. However, the costs can be a lot higher if the premium equipment is purchased. While optional, lessons can be an additional cost if you choose to enroll your child in it. If a team enters a tournament, additional tournament fees can apply. Depending on the tournament, these fees can cost more than $100 for the entry as well as the travel fees. A small processing fee may apply when you register online or in person. This fee should usually be under $25 and will depend on the park through which your child plays. Talk with your local director to see what is going to be included in the league. What you are going to find is that leagues across the United States are going to vary in pricing and equipment. Keep your eyes peeled for registration dates. Most leagues will start registration months ahead of time and may even give discounts for people who register before a specified date. Little league divisions will follow the official baseball rules as defined by Major League Baseball. A regular game is six innings long and a game is considered official after four innings. In intermediate leagues (13-18 years old), the game is seven innings. Bats that are made from a material other than wood must be approved by the league. Generally, the maximum length is 33 inches and the diameter cannot exceed 2 1/4 inches. If a team were to advance to the World Series, all accommodations would be paid for by Little League Baseball. Some leagues will give discounts to families who enroll more than one child at a time. There are some high-level little league teams that may do fundraisers to help pay for equipment, tournaments, travel, and team gear. Before your child takes part in little league, consider signing them up for a basic youth league at a local park. You can see if the child really loves the game enough to pay for little league as well as invest in all of the equipment. Some leagues will offer a discount to those who volunteer.